Naomi Washington-Leapheart, a daughter of Detroit, is the Faith Work Director for the National LGBTQ Task Force, the country’s oldest national LGBTQ justice and equality group. She is also an adjunct faculty member in the Theology and Religious Studies department at Villanova University. Before joining the Task Force, Naomi was the suburban community organizer for POWER, a multi-faith, multi-racial network of congregations in Metro Philadelphia. She also served as Co-Pastor and Minister of Music at the Wisdom’s Table at St. Peter’s United Church of Christ. 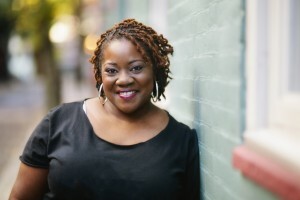 She is affiliated with the Fellowship of Affirming Ministries and the United Church of Christ, and earned the Master of Divinity degree from Lancaster Theological Seminary in 2016. Naomi delights in singing with the Philly Threshold Choir, a group whose mission is to bring audible comfort and kindness to people in hospice care. She is a board member of Roots of Justice, a collective of anti-racism trainers and organizers. In 2016, Naomi was invited to serve as a member of the Faith and Spiritual Affairs Advisory Board of the City of Philadelphia Department of Behavioral Health and Disability Services, and in 2017, she was appointed by Mayor John Kenney to the Philadelphia Commission on LGBT Affairs. Naomi’s work is included in the volume,” From Generation to Generation: A Commemorative Collection of African American Millennial Sermons from the Festival of Preachers 2010-2015, a rare and unique compilation of what the nation’s most promising young African-American ministers are thinking and proclaiming about the Christian faith (Chalice Press, 2015).